2011–12 has been an encouraging year for us. Not only did we strengthen our internal capacity, but also successfully built a stronger, credible presence in the UK by reaching out to wider audiences. But most importantly, we increased funding to our supported projects - Gram Swaraj Sangh, Kutch and Jago Foundation, Jharkhand - in India. During the year, we have managed to raise over £150,000 thanks to your support and commitment towards the cause of child rights. Our 2011 signature annual event – CRY UK’s Corporate Cricket Challenge (4Cs) entered its seventh year and was attended by cricket legend the Late Mansoor Ali Khan 'Tiger' Pataudi, while Bollywood veteran actor Sharmila Tagore was one of the key speakers of our Annual Charity Fundraising Dinner - Pledge 2011. These events enabled us to increase our fundraising targets and reach a diverse audience, who are passionate about the cause of marginalised children and want to bring about sustainable change in their lives. The year also marked the formation of the CRY UK Advisory Committee (AdCom), a group of high- ranking senior management officials from the corporate, legal and hospitality sectors, whose help, support and guidance will enable us further our operations and reach in the UK. We are proud to announce that in 2011, CRY UK branched out to Leicester to form its first Volunteer Action Group (VAG) outside London. Finally, we thank all our supporters, donors and volunteers, who ensured that our fundraising targets were met and events were a success. The amount raised has enabled us to reach 21,249 children living in 220 settlements across Gujarat and Jharkhand, India, to ensure 100% enrolment and retention in schools, protection against easily preventable diseases and eradication of child labour. 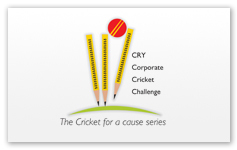 Play 20/20 cricket with a minimum of 3 games per team and help raise funds for underprivileged children in India. Click here to register. CRY UK in association with Morning Chasers Running Club and Regent Park presents ‘The Regents Park 10km Summer Series races 2012’. It’s a mixed ability race series for all runners including those who wish to walk. For more details, please contact, Jaimin Shah on 07940589732. Our New Year Dance Gala for the benefit of underprivileged children on January 27, 2012 held at Gilt Bar, London made sure that our supporters begin their year with the cause of underprivileged children in India. On July 1st, 2011, we organised a photography exhibition titled ‘Come Share my World’ in London. The exhibition showcased photographs clicked by children from CRY UK supported project which captured their aspirations, expressions and voices. Legendary actor Sharmila Tagore was the Guest of Honour at our Annual Dinner - Pledge 2011 in London. The event was attended by 350 attendees and helped us raise £58,000 for project Gram Swaraj Sangh (GSS). For more details, please click here. The 7th CRY UK Corporate Cricket Challenge (4Cs) 2011 was inaugurated by cricket legend the Late Mansoor Ali Khan ‘Tiger’ Pataudi and his actor wife Sharmila Tagore. We raised £28,800 for CRY UK supported projects Jago and GSS in India. Click here to view event coverage. 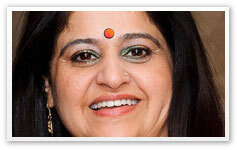 “In 2009, I visited Jago Foundation, a CRY UK- supported project in Giridih district, Jharkhand. 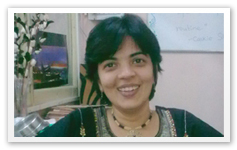 Nina Munshi, a CRY employee shares her experiences of visiting a CRY project visit in India. 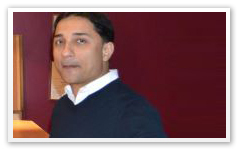 Dhruv Jajodia, a 6 year old boy, walked for child rights and raised £649 for CRY UK. Now, you can also fundraise for us with our new initiative– ‘My Occasion and CRY UK’; where you can celebrate your special day– Birthday, wedding, anniversary or an achievement – with the cause of underprivileged children in India. Simply ask your family, friends, colleagues to donate to CRY UK as a gift to you. Click here to know more. Contribute a small amount every month that will go a long way towards ensuring every right for every child. Click here to know more about the Standing Instruction scheme. 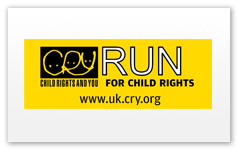 CRY - Child Rights and You UK (CRY UK) is a registered non-profit organisation working for every child's right to a childhood - to live, learn, grow and play. Along with grassroots partners, we work with communities and parents to ensure lasting change in the lives of underprivileged children in India. 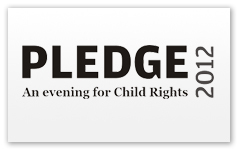 Child Rights and You UK is registered charity no. 1119026. Please feel free to forward it to a friend. If you do not wish to receive further emails, or if you have received this message in error, please accept our apologies and simply unsubscribe.